Fertilizer can improve the appearance of gardenia leaves. Some leaf yellowing on gardenias at specific times of the year is a normal part of the growing process, but excessive yellowing at some times of the year generally indicates a problem. Yellow gardenia leaves usually indicate some form of stress on the plant, either from disease or environmental conditions. The most likely diseases are root-knot nematode and root rot. An imbalance in the soil pH and nutrient levels can also cause yellow gardenia leaves. Normal yellowing occurs in late winter or early spring. Gardenias are evergreens, but even evergreens shed their old leaves at some point. Old leaves turn yellow and fall right before the new growth starts. If gardenia leaves start turning yellow and falling in late spring, summer or fall, a stress factor is causing the problem. 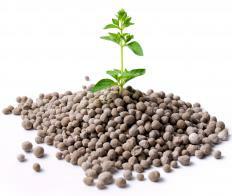 Soil pH is important for gardenia health. These plants are acid loving, so when the soil gets too alkaline, it can cause the leaves to turn yellow. This is called chlorosis. Without the right nutrients, the gardenia does not produce enough green pigment, resulting in yellowing leaves and early leaf drop. When the soil does not contain enough usable iron, it causes chlorosis. Gardenias need a soil pH range of 5.0 to 6.0. If the pH is above 7.0, it indicates a lack of usable iron in the soil. Soil with a high pH, indicating an alkaline environment, should be amended with aluminum sulfate or water-soluble sulfur. Root-knot nematode is a pathogen that causes yellow gardenia leaves. The disease is caused by tiny roundworms that infest the gardenia root system. As the pathogen population feeds, it damages the roots, reducing the plant's ability to effectively absorb water. The leaves turn yellow as the gardenia starts to dry out. Another disease that could be at fault is root-rot. This disease is caused by one of several fungus species, including Pythium, Phytophthora and Rhizoctonia. The fungus causes the roots to rot. As the roots rot, the plant is not able to absorb moisture and nutrients effectively, causing yellow gardenia leaves. Yellow gardenia leaves can also be caused by over watering or under watering and poor soil conditions. Gardenias need consistent moisture to stay green and healthy. Good drainage is also critical. Wet roots start to rot, preventing the gardenia from absorbing water and nutrients. Poor soil is also a cause of yellow gardenia leaves. Well-seasoned manure or compost can help improve soil nutrition. An application of fertilizer designed for acid-loving plants can also improve the health of a gardenia with yellowing leaves. Adding Epsom salt to the water for a gardenia helps balance the pH and gives nutrients to the plant. I treat my gardenia with Epsom salt every two to three months. Gardenias are only happy when the soil has good drainage. Otherwise the roots rot and the leaves turn yellow. @ddljohn-- Have you had the pH of your soil measured? I highly recommend finding out the pH of your soil first. More than likely, it's a pH problem and you can fix it with an acidic fertilizer. It's good that you added iron to the soil. The other possibility is fungi or insects. I've heard that adding cornmeal to the soil around the gardenia helps. My neighbor tried this and the gardenia leaves are green again. My gardenia's leaves have turned yellow recently. I bought iron and added iron to the soil, as well as fertilizer but nothing has changed. The leaves are still yellow. I'm not sure what the problem is, what should I do?